Dried fruit, mixed nuts, M&M’s and a whole lot of determination. 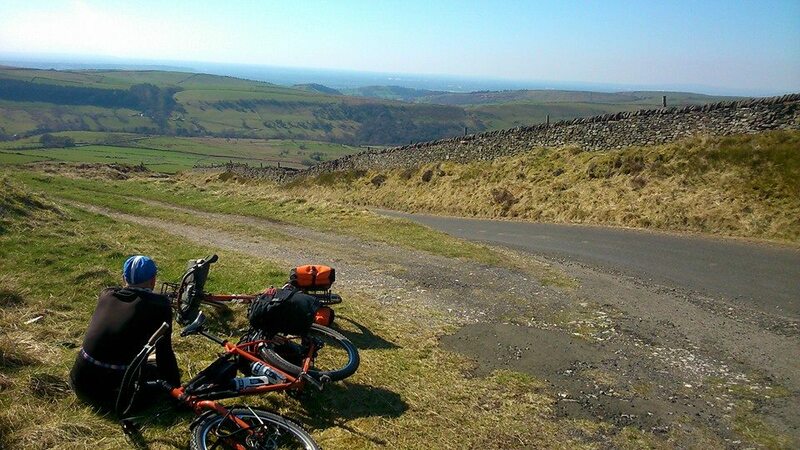 This is what was required to get me and my good friend Matt through the hellish and seemingly never-ending climbs offered up by the route we picked from Manchester city centre out to our campsite at Monsal Head. 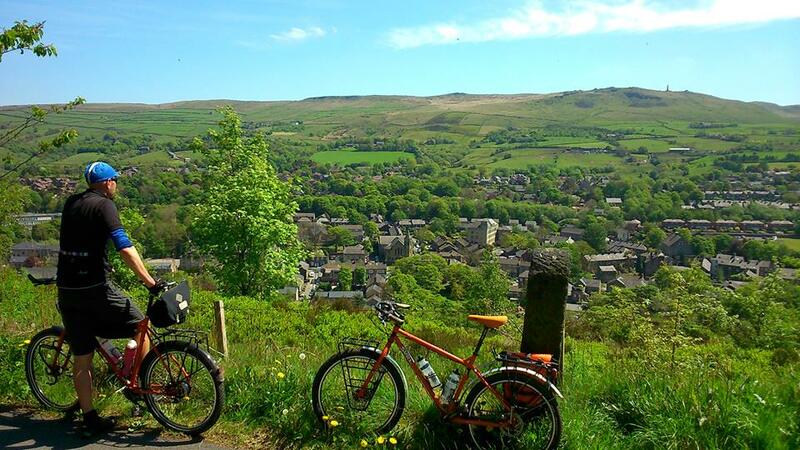 It was an early spring day, the sun was shining and we pedalled off without a care in the world. That wonderful realisation that I was only getting further away with every pedal stroke washed over me and I revelled in the knowledge I’d be under canvas that evening. 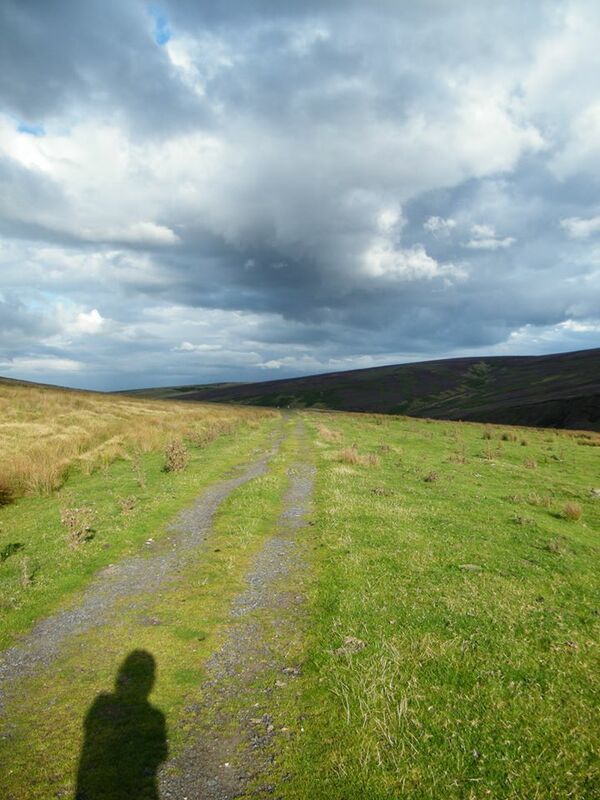 As is the way of things, we took a rather indirect route that promised the least traffic and the best scenery. And we took our time about it. We rolled along, chatting about everything and nothing. We stopped for coffee. We went the wrong way. We didn’t have a care in the world. “HILLS ARE OUR FRIENDS!! 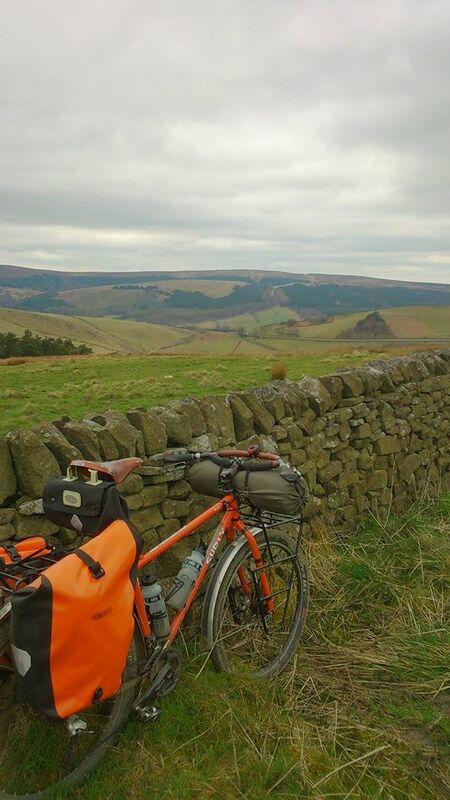 !” cried an over-enthusiastic roadie (with a mountain cassette & rear mech, I might add) as he crested the climb we’d just ground up on our loaded Surly Trolls. 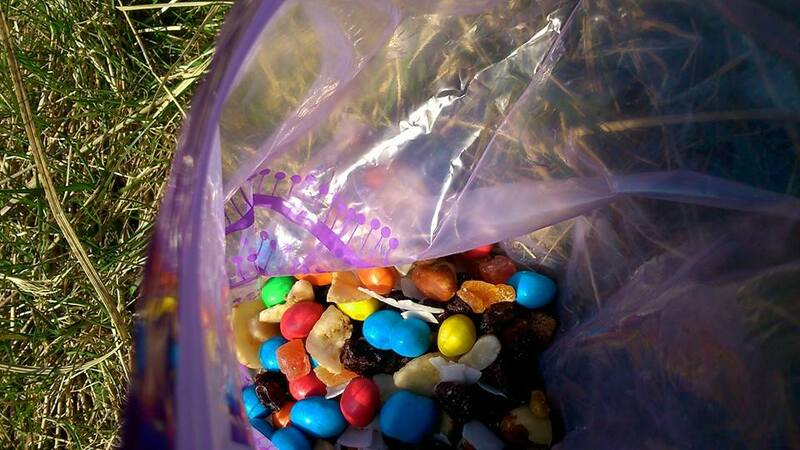 We quietly returned our gazes to the view and had another handful of Matt’s Special Trailmix. 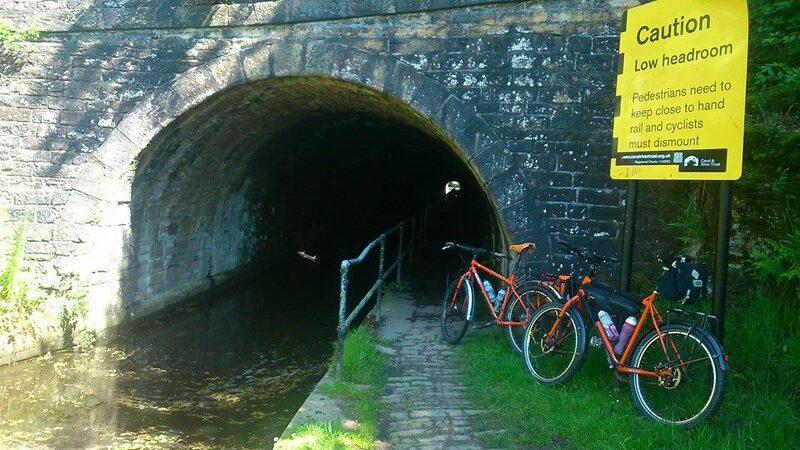 Soon we found ourselves crunching down the Monsal Trail, marvelling at the scenery and scaring the bejesus out of wildlife inhabiting the trailside hedges. “You’re not exactly sure where the campsite is…?” I asked Matt as we examined several questionable looking side trails. Naturally, we turned down the wrong one and soon found ourselves faced with a decision: ford the obviously-deeper-and-faster-flowing-than-it-looked river or somehow portage the bikes & luggage over an extremely narrow concrete bridge. Forming the least efficient two-man chain in history, we took option B and passed bag after bag to each other before we took turns hoisting our heavy steeds over our heads in some kind of obscure strong man competition. 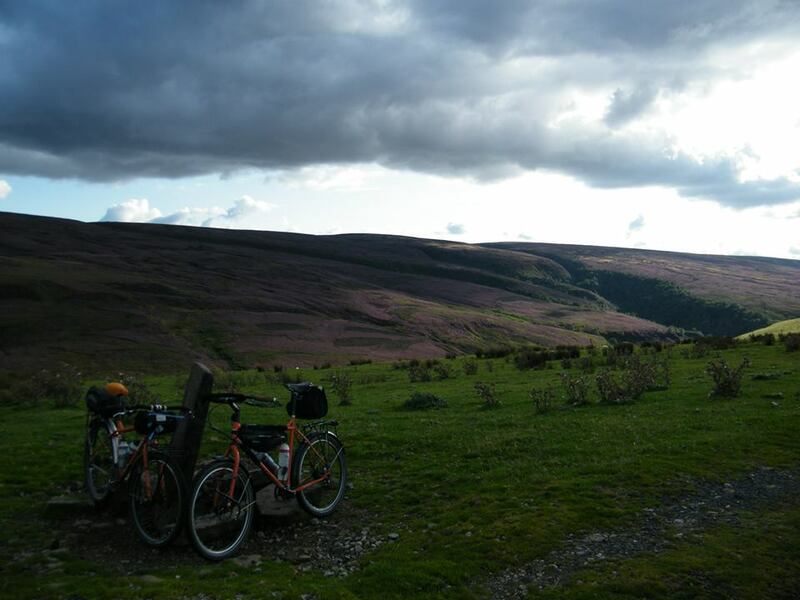 Safely on the other side of the river, I turned right up a slightly sketchy looking bit of single track which very quickly ramped up to at least a 10% off-camber incline through the bracken as the trailside drop to the river grew ever deeper. Defeated by all that nature and gravity threw at us, we pushed the bikes the final few yards to the top of a much better manicured trail that would’ve brought us to exactly the same spot without the ridiculous river crossing. Dammit. 10 minutes later, we were parting with altogether too little cash for a pitch in a beautiful secluded campsite we had almost completely to ourselves. In the local pub, we demolished an excellent plate of belly pork, mash & gravy and sampled a couple of pints of local ale. In the interests of science, you understand. Continuing my scientific experimentation, we sampled several more pints of local ale and (here’s the ‘genius’ part) shunned the siren call of the open fire, preferring instead to drink our beers outside. In early spring. In North Derbyshire. Atop a hill. “To acclimatise ourselves”, I said. Matt shivered, unconvinced, but stuck it out all the same as we put the world to rights like only 2 drunk men can. Dressed in every scrap of clothing I’d carried with me (including wooly hat and gloves), I crawled into my sleeping bag and spent the night desperately (and unsuccessfully) willing my body to sleep. Dang, that was COLD. The next morning, we shared an odd breakfast comprised mainly of questionable malt loaf, squeezy cheese and the most incredible cup of tea I think I’ve ever had. We packed up and made our way into Buxton where we descended upon an unsuspecting cafe for a very leisurely second breakfast. Man, that was good. 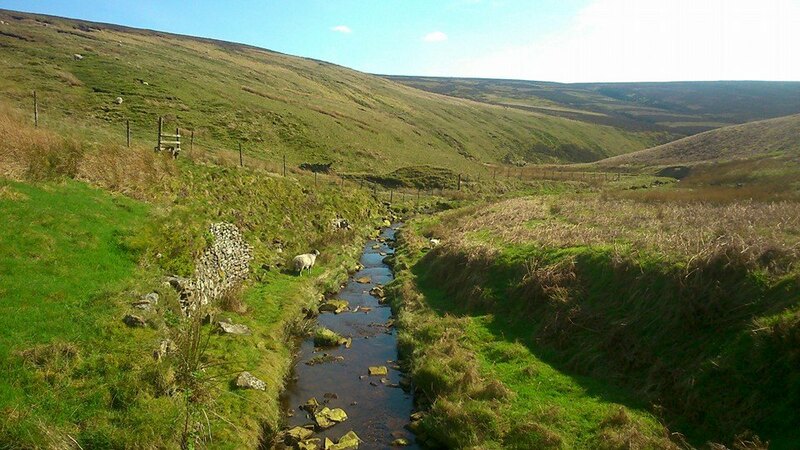 The cruelly named ‘Long Hill’ out of Buxton mocked us and, by the time we reached the Pennine Bridleway, Matt was starting to regret that extra piece of fried bread. In my defence, I did try to warn him, in between mouthfuls of extra black pudding. Sufficiently warmed up again, our usual childish ways came to the fore as we tore up the trails, jumping the bikes over everything we could find on the way home. It was a fine weekend. A fine weekend indeed. This stuff doesn’t happen by accident, you know. The hours minutes of dedication that go into thinking up an appropriate song title, drafting a blog entry, taking amateur photographs… Yes, yes, I know it’s harder work to read this rubbish but still. Choosing the right song for today’s post started out as they all do. 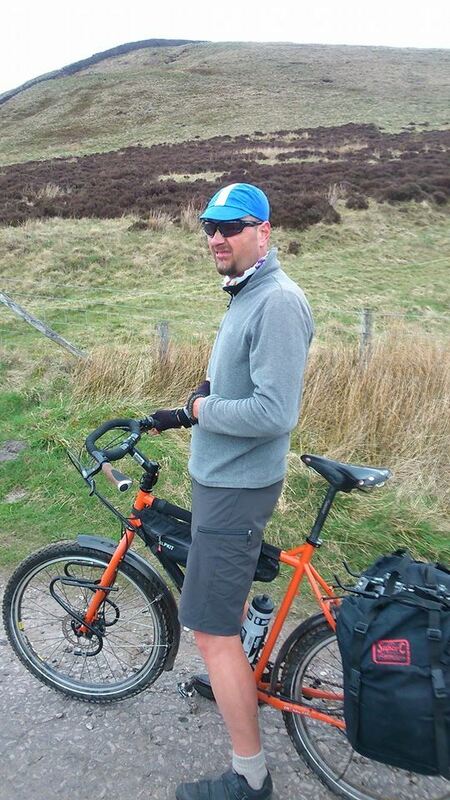 I was pedalling along, letting my mind wander and hoping some kind of inspiration would strike. Alas, it did not. Oddly enough, despite being in the saddle for all of 10 hours, I didn’t even get a song stuck in my head (another excellent method). Yep, I was starting to get worried. And then, a few miles from home, my riding companion came alongside complaining that his day-long earworm had been Meatloaf’s Bat out of Hell. Now, I happen to love that song but poor old Matt hates it. Naturally, it was the perfect… nay, the only choice. 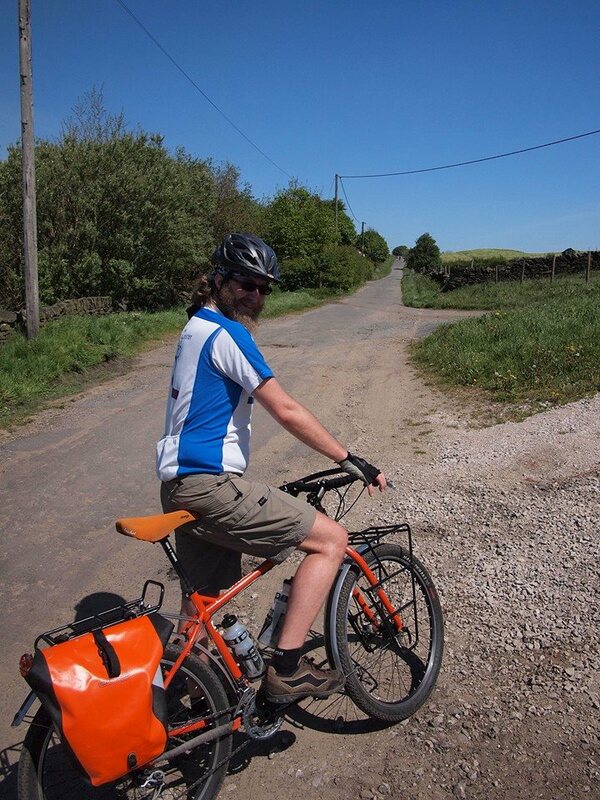 Oh, I should point out: Trollfest, the third was an 80ish mile ride from York to Hadfield on the Trans Pennine Trail, about 80% of which is off-road. 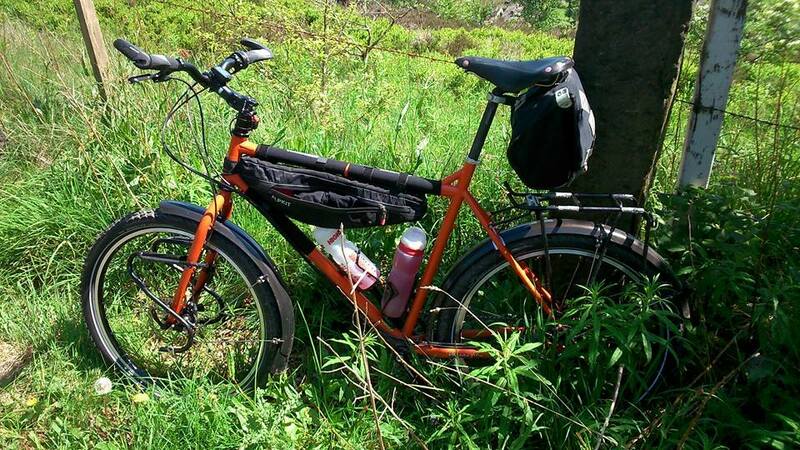 And, of course, we were doing it on a pair of Surly Trolls. And, for reasons I still don’t fully understand, we decided to do it in one day. All of this didn’t leave us much time for photographs, let alone good quality ones. It was still dark as we boarded the train from Manchester, clutching our coffees and nervously joking about “what could possibly go wrong”. Shortly after arriving in York just before 08:30, we took the obligatory dodgy start line photo and immediately set off in what turned out to be the wrong direction. Luckily enough, this was about the worst thing that happened all day. 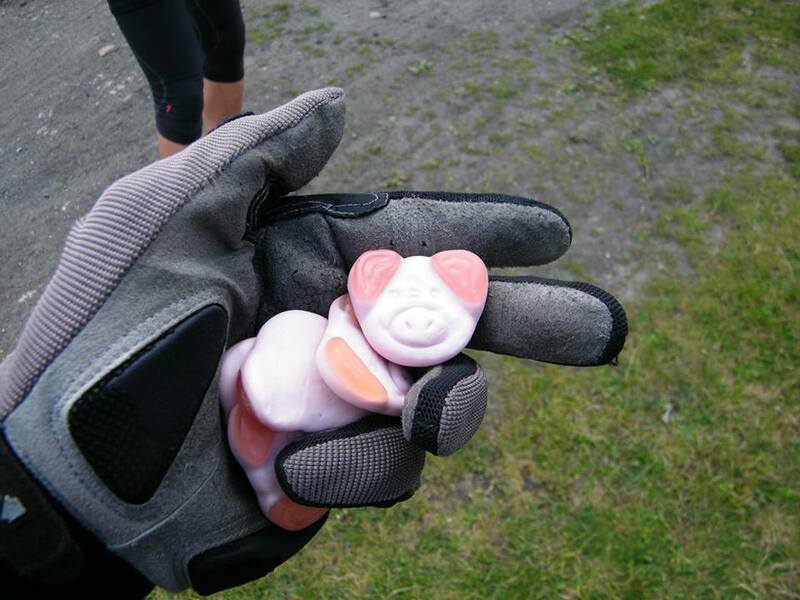 Once again Matt had been sent with a bag of dodgy looking jelly sweets, this time in the shape of ‘Percy Pig’. My initial reaction was polite yet abject horror, which didn’t stop me nomming one. As I feared, it was a weird bubblegum crossed with cheap sofabed foam kind of chewy textured mouthful of instantly regrettable sweetness with a flavour unlike anything occurring in nature… which didn’t stop me nomming the rest of my handful with the enthusiasm of a one-eyed starving dog let loose in a meat factory. I disappeared into the woods to …ahem… water the flowers while Matt polished off almost the rest of the delicious, delicious bag. It wasn’t until we reached Aldham near Barnsley that we allowed ourselves a brief photo opportunity and a moment to drop the pace a little. 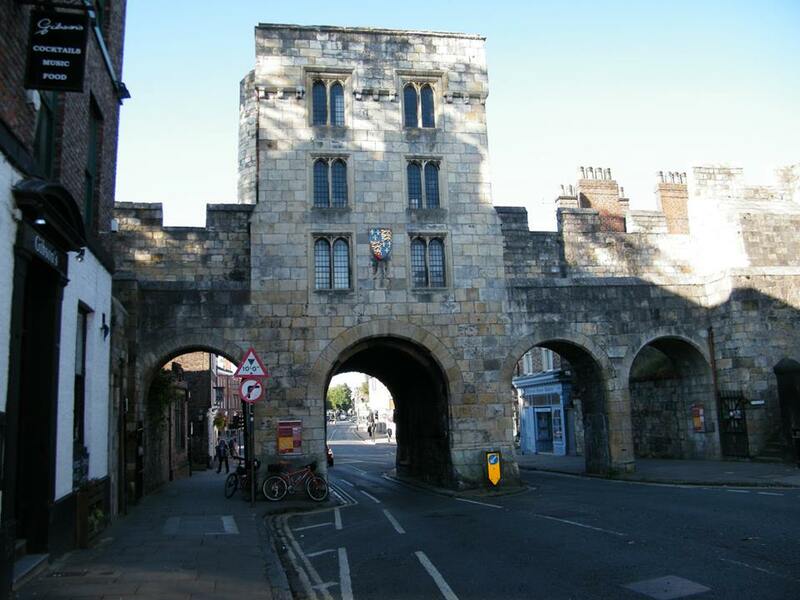 Since leaving York, we’d been maintaining a ridiculous pace, not stopping for anything (especially the crazy women on horseback who referred to us as “Boys… BOYS!” as we rode past). At Selby, the plan was to come off NCN route 65 and onto route 62 (or the other way around, I forget which) but both trails were randomly closed and diverted around the back of a factory straight out of The X-Files (or so we thought)… It took us a few miles and quite a bit of backtracking to realise we (and another pair of cyclists) were hopelessly heading in the wrong direction. 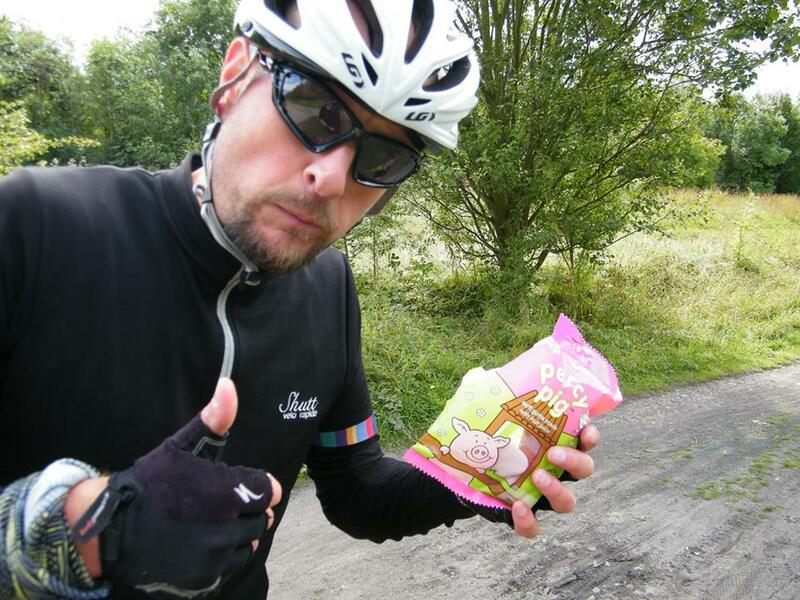 We got back on track and continued tearing through some beautiful roads and trails in North Yorkshire, scaring the bejesus out of small animals, children and roadies on their oh-so-shiny carbon bikes. Maybe it was the 5am start. Maybe it was the extra pressure of the unplanned diversion on our already tight schedule. Maybe it was just my desire to change body position on the bike. 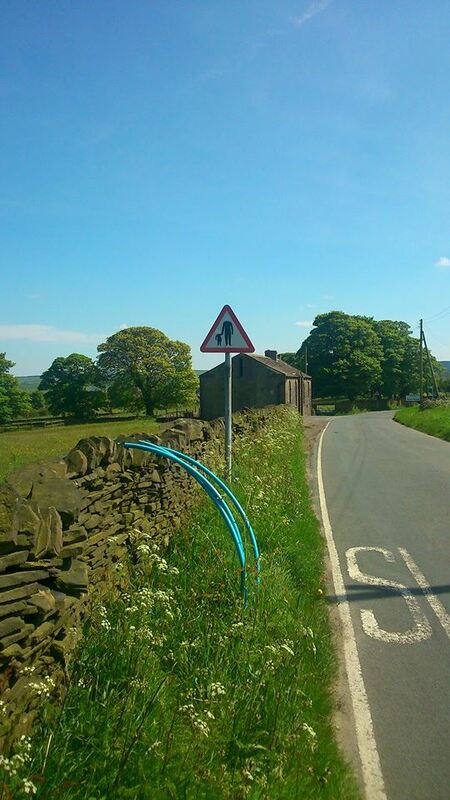 Who knows what it was but something just told me to trust myself, kick it into the highest gear I could find, rest my forearms on the bars, dangle my hands over the front of the bike in that frighteningly unsafe way you see the pros doing it on Le Tour. With the wind whipping through my beard, I glanced back and saw the gap increasing. Looking up again, I was greeted with a mixture of respect, revulsion and bewilderment from the lycra louts heading in the opposite direction. Matt later remarked he wished he’d been able to get a picture of it. I wish he had too. Oh, I almost forgot! 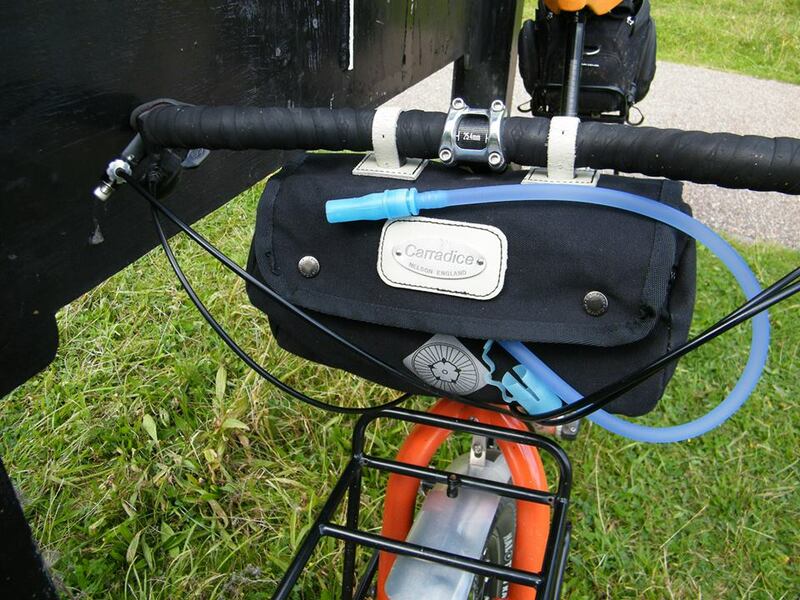 If you’re planning to go time trollin’ yourself, you’re going to want a Heath Robinson solution to your hydration needs. Who says you can’t fit a water bladder into a small Carradice bag? 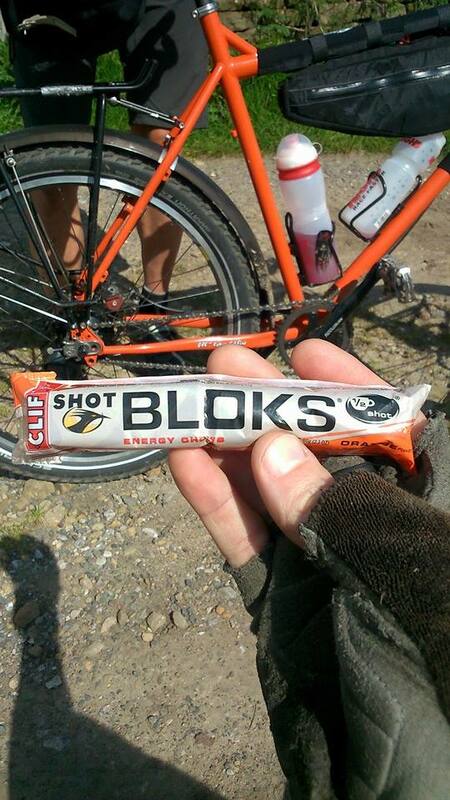 Probably the same people who say you can’t go time trialling on a cargo bike without time trial bars, that’s who. Anyhoo… with over 50 miles taken care of in about 4 hours, spirits were high but I was starting to feel the effects and my lingering knee problems were starting to flare up. 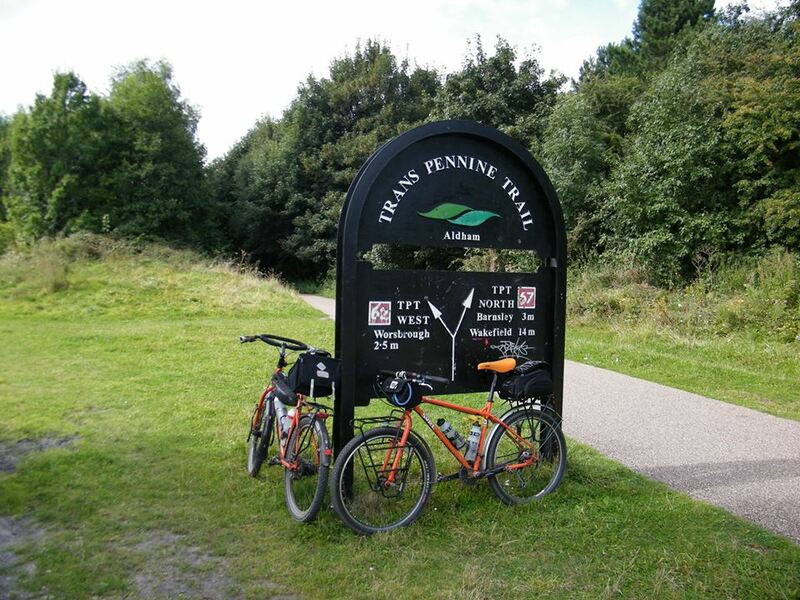 Also, the climb out from the end of the Dove Valley Trail past Winscar Reservoir up to Dunford Bridge at the highest point on the Trans Pennine Trail was looming ever closer. Or so I thought. My mind was about 30 miles further into the ride than my body was. 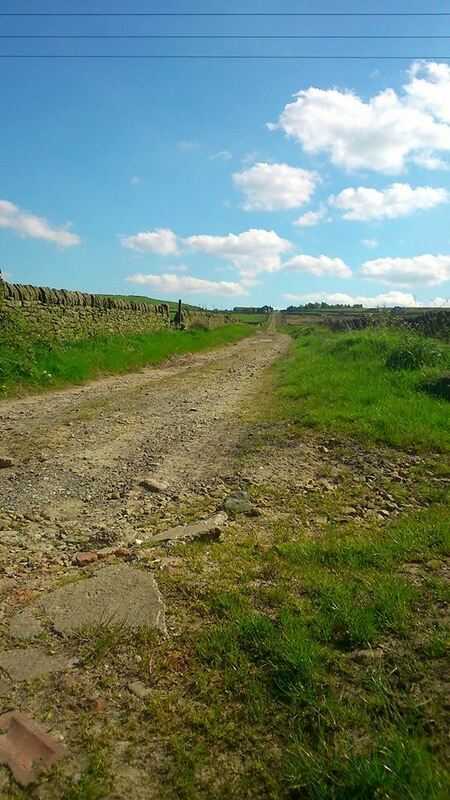 The miles through Silkstone Common, Penistone and Oxspring were awful. To add insult to injury, as we neared the bottom of the climb we’d been dreading all day and we were at the very lowest of our lowest ebb, the heavens opened and the hail came down. Cowering in a random bus shelter, we layered up and ate almost every piece of food we had left between us. All too soon there was nothing left to do but attempt the climb. At least the rain had eased off a little. 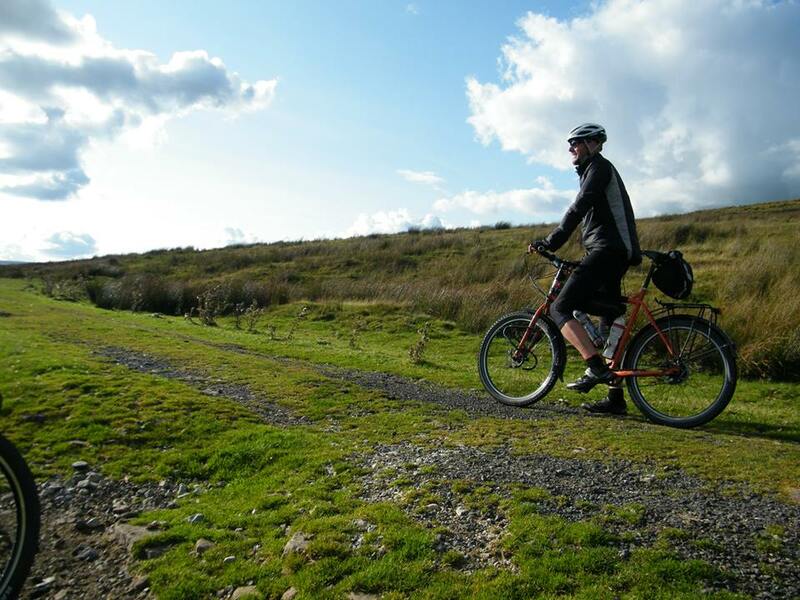 I’d already resigned myself to the fact I’d be walking at some point, I was staggered to find myself out of the saddle, dancing on the pedals for the initial steep section. 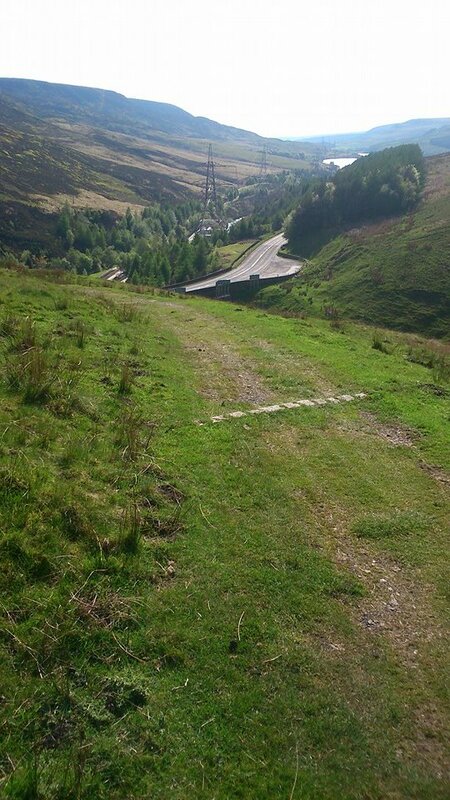 As the incline eased slightly, I sat back down, found a sweet spot in the gearing and just enjoyed the climb. Glancing back, I saw Matt gazing off into the distance as he too found his rhythm. All too soon we were punching the air, whooping in delight and sliding the bikes sideways on the slippery tarmac of the Woodhead Pass road. Hepped up on a cocktail of adrenaline and whatever energy products we’d eaten, we stormed across the Woodhead Pass trail, worrying the sheep and taking celebratory pictures. I believe one of these is what the Young People call ‘a selfie’. 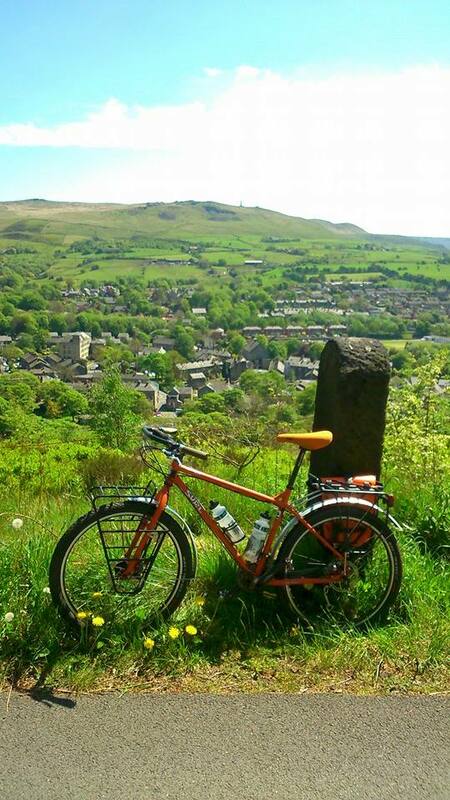 From here, it was all wild downhill with more whooping until we hit the Longdendale Trail which I attacked like a Bat out of Hell (see what I did there?). More time trollin’ ensued and we simply didn’t relent until we piled into the pub. Total mileage for the day: probably close to 90 – by far the biggest ride I’ve ever done in a single day. 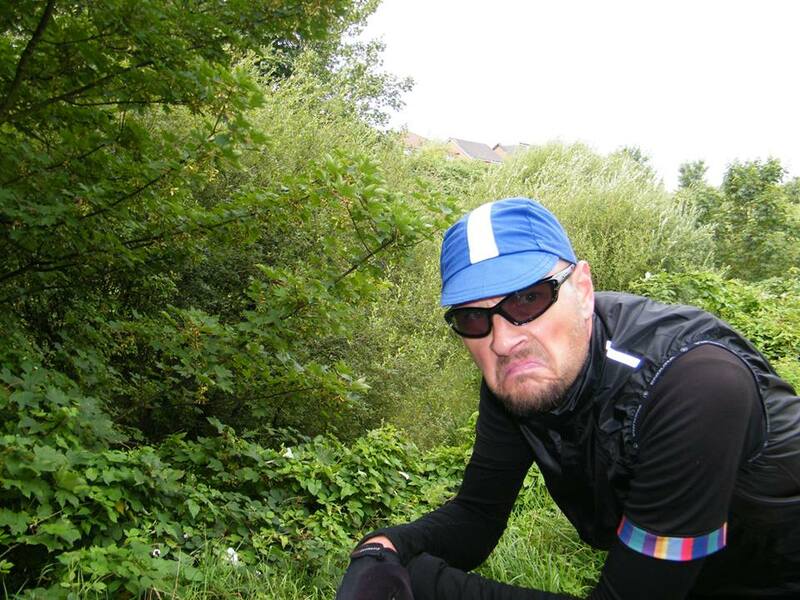 Sometimes when I’m out cycling, I get a song stuck in my head. More often than not, it’s one of those hideously annoying songs I somehow know all the words to but will never freely admit to recognizing and would certainly never buy a CD of, not in a million years. My most recent earworm was the unfortunately apt Ferry cross the Mersey. Why was this song going through my mind over and over and OVER AND OVER? 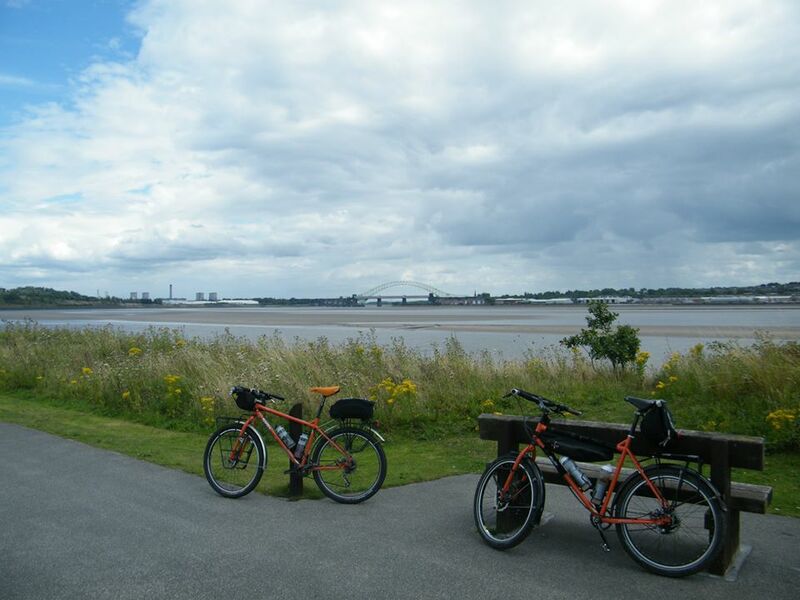 Well, it just so happens I was cycling along the banks of the River Mersey and, like a bleeding tourist, stopping to take photographs like these ones of the Silver Jubilee Bridge in the Mersey Estuary. What was I doing in Merseyside being a bleeding tourist? 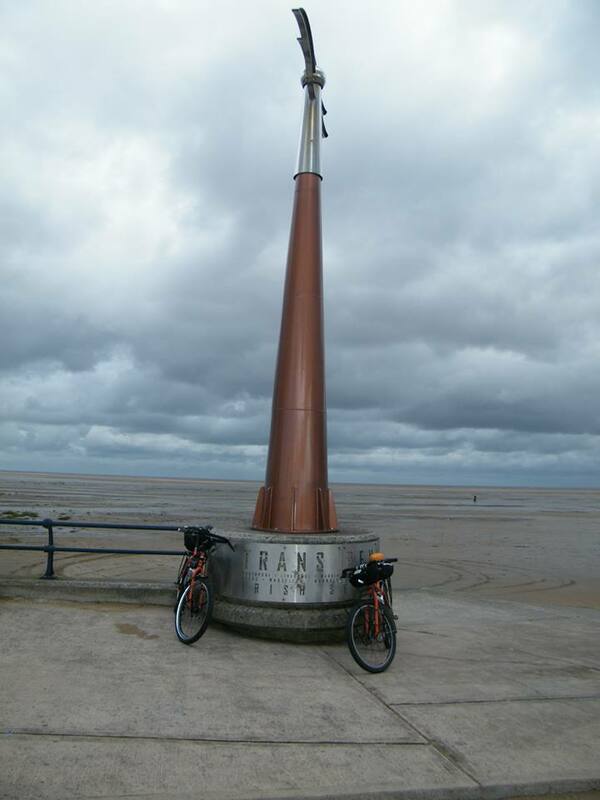 Well, I was making my way back to Manchester via the starting point of the Trans Pennine Trail at Southport. Yes, the Northern Walker and I had somehow managed to convince our respective other halves to let us escape for the day so we hopped on a train at Manchester Piccadilly to the somewhat underwhelming start point at Southport. We decided not to dip our wheels in the sea (what with it being about 5 miles out), much to the relief of the RNLI guy who looked like he’d had to rescue far too many cyclists from the mudflats. 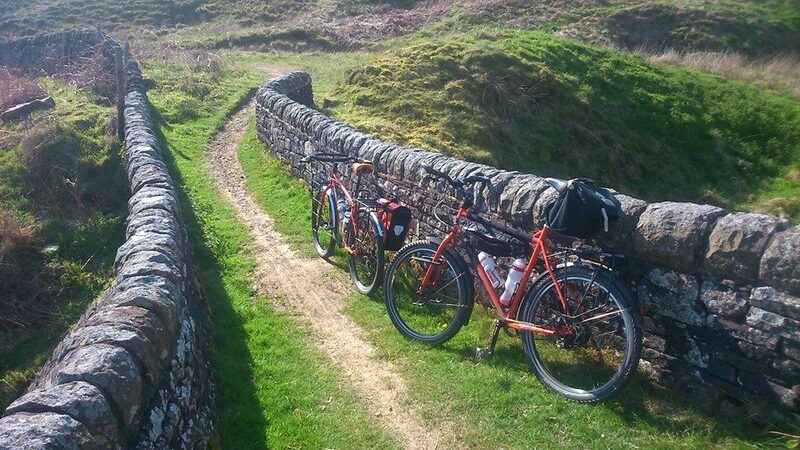 Instead, we set off into a relentless headwind on the exposed coastline which, coupled with the dull route, made the initial part of the ride a bit of a chore. 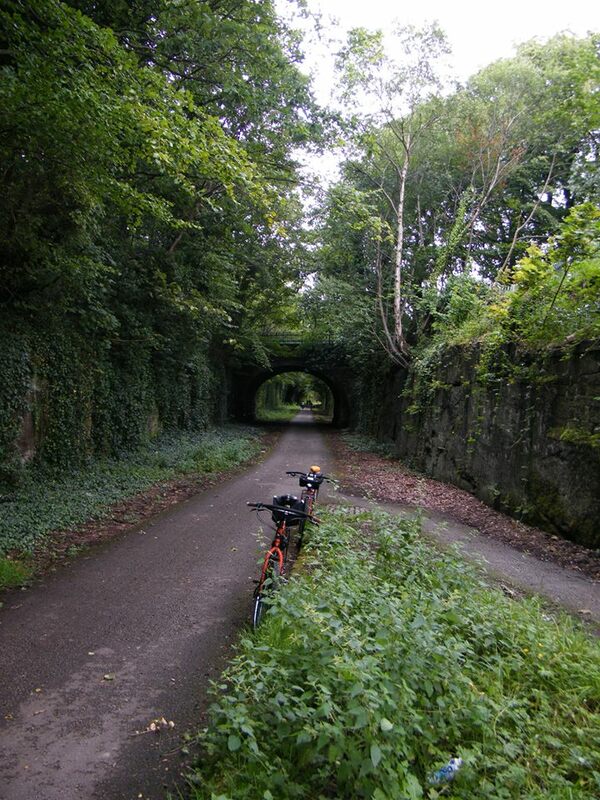 Eventually, we turned slighty inland and enjoyed miles of deserted trails and country lanes as the early morning sun started peeking through the grey clouds overhead… until we reached the start of the Liverpool Loop Line which was closed apparently due to asbestos being removed from a bridge. We were not amused. 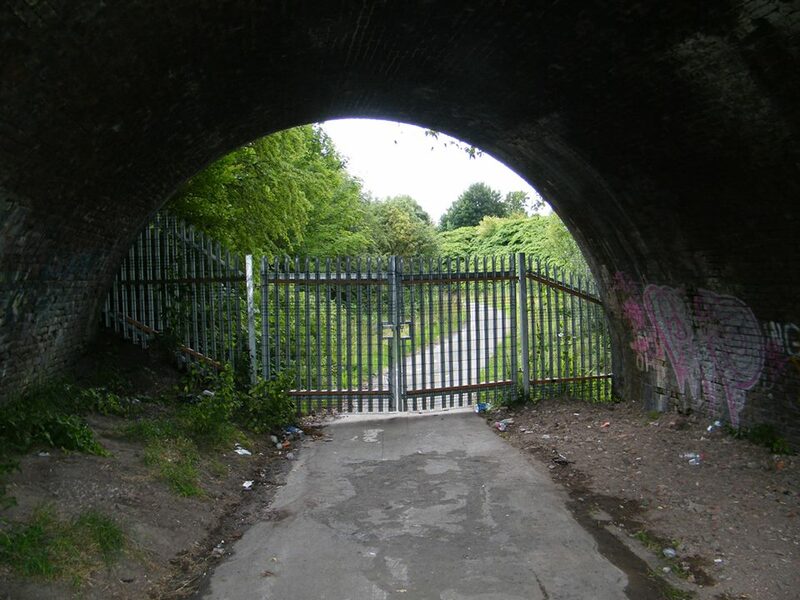 Not least because the diversion was poorly signed but when we could navigate our way through it, we increasingly found ourselves riding through some of the worst neighbourhoods and decrepit industrial estates in Liverpool. Just when we were at our grumpiest, we happened across a HUGE supply of the plumpest, sweetest wild blackberries which we scrumped until our bellies were full and our moods improved. Back on track and after a couple of unplanned diversions (thanks to whoever turned the sign around), we eventually made our way onto the Liverpool Loop Line proper which is an old railway bed carved directly out of the sandstone. Purty. 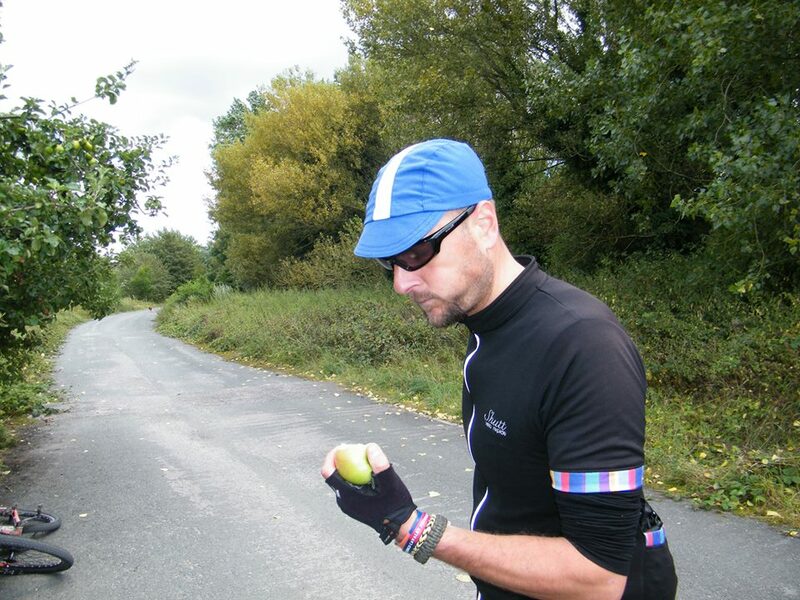 We paused for an apple and some questionable yet strangely morish jelly sweets and discussed the pros and cons of Surly Open Bars vs Jeff Jones Loop Bars. 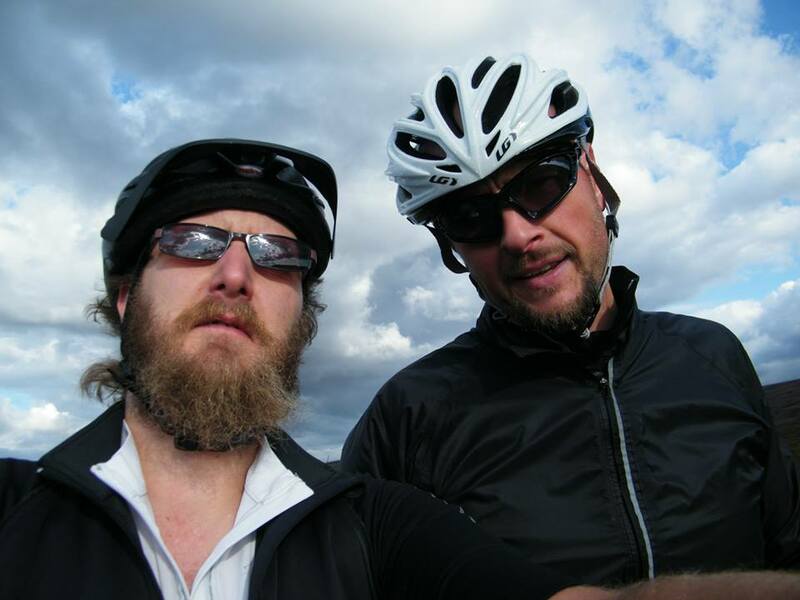 Last time we rode, Matt’s Troll was sporting some el cheapo riser bars and I had a set of Jones. 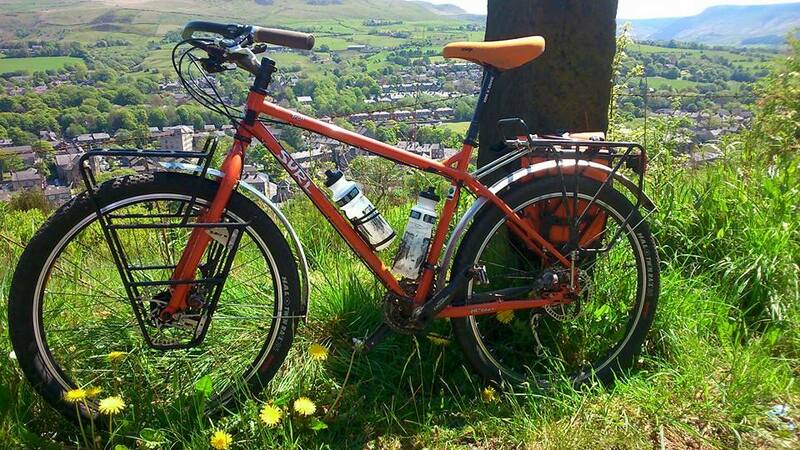 This time, Matt had a brand new set of the Loop Bars and I’d switched to the Open Bars. Which is better? Well, I still love the Jones bars but, boy are they expensive. Sure, I got a killer deal on my Surly bars but even at full price they’re considerably cheaper and I still have plenty of hand positions. 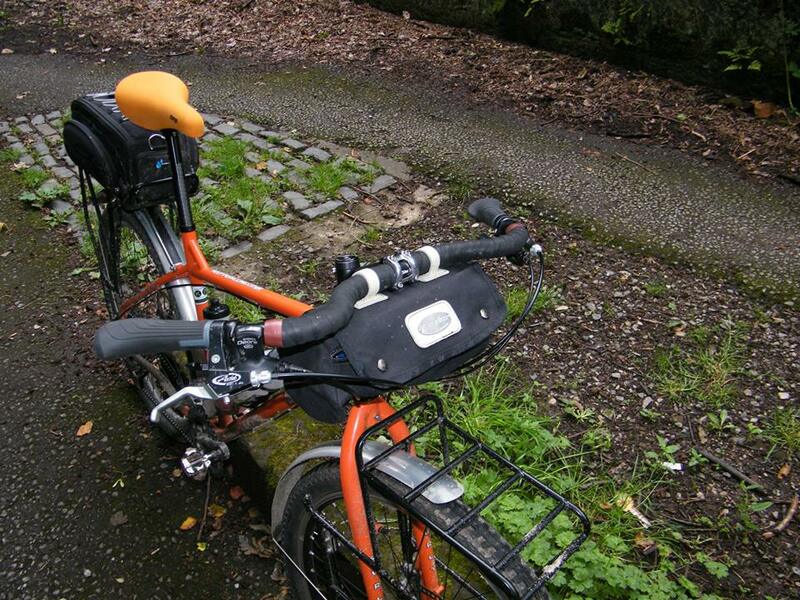 Plus, a small Carradice bag sits neatly underneath, giving me ample room to stash a spare tube, some tools and whatever strange munchies I can lay my hands on. 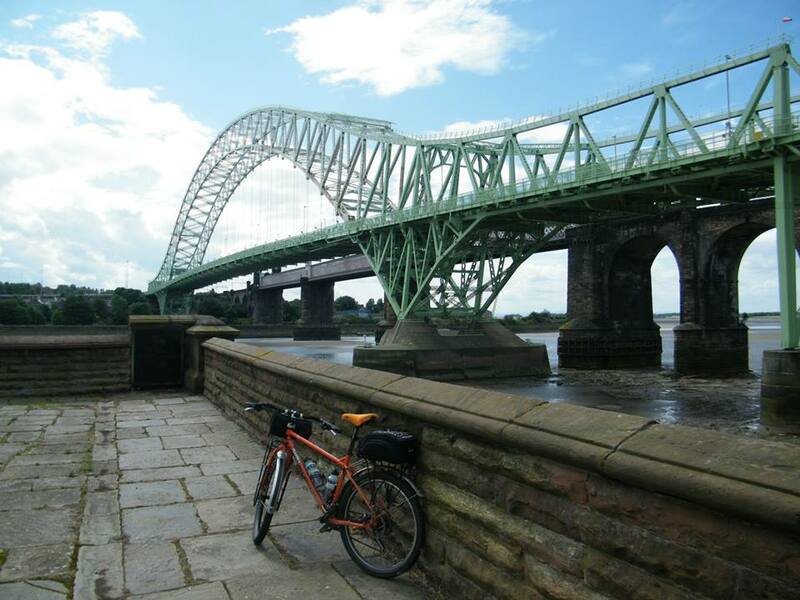 We pushed on through Merseyside, wondering if we’d ever make it Warrington and starting to question the advertised mileage on the map as time marched on and our curfew approached. The bullet holes in the TPT signs in Halewood helped motivate us to pick up the speed until the thatched cottages in the beautiful Hale Village almost stopped us in our tracks. The wild plums I found at the roadside were enough to stop us completely for a few delicious minutes. 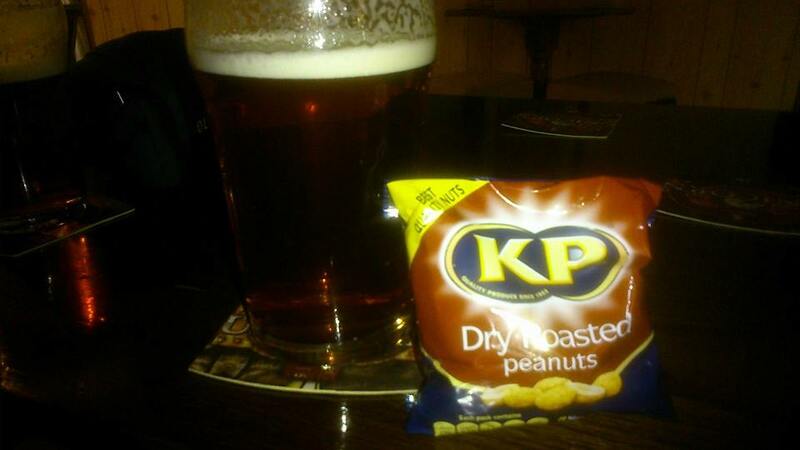 We finally made it to Warrington, now convinced the mileage on the maps was pure fantasy so we stopped for that oh-so-traditional cycling nutrition: beer & peanuts. 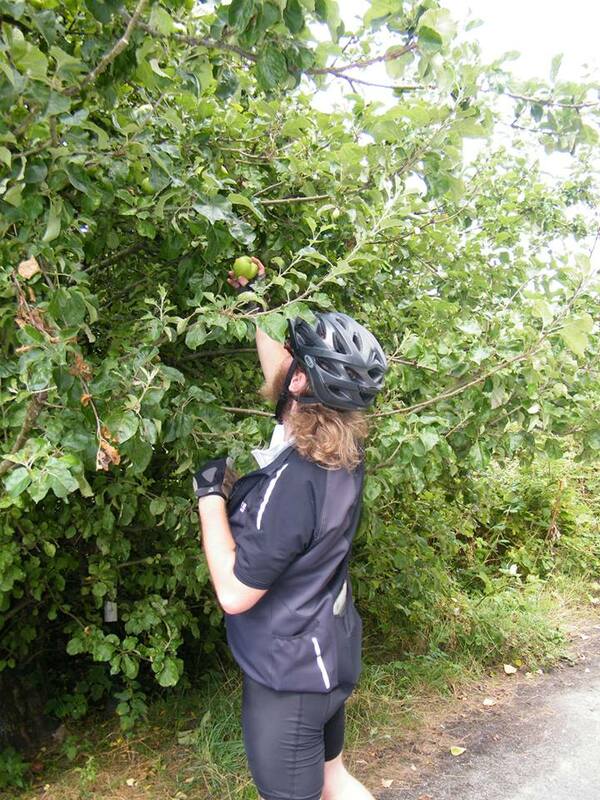 A little further on and I spotted yet more trail side foraging and set about grabbing myself an apple. Matt wasn’t convinced they’d be ripe just yet. 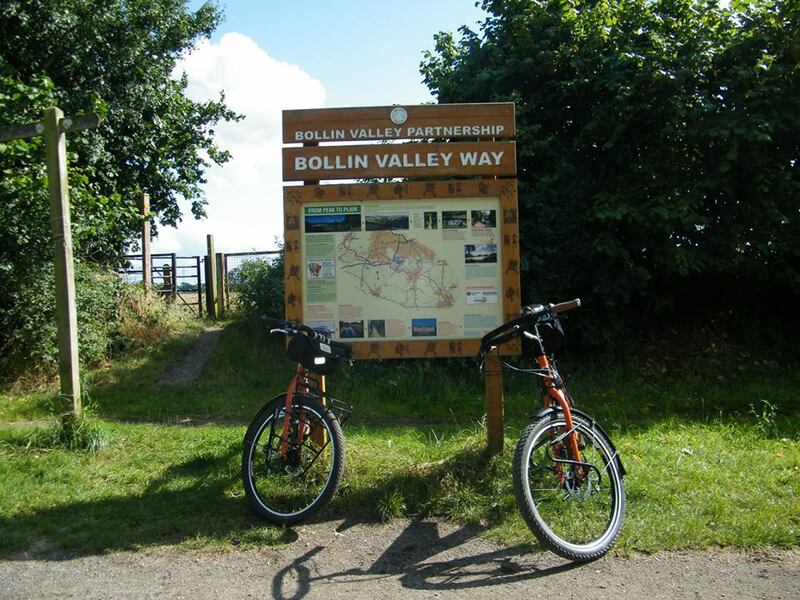 We neared home via the Bollin Valley Way, stopping only to avoid mowing down small children, double check the route and eat a huge slice of fruit cake. At Sale, we decided to skip off the TPT in favour of the Bridgewater Way which I knew would take us home to yet more cake. What I didn’t know was that just about everyone else had the same idea which meant the trail was uber busy, hampering our progress. Even worse, the trail was blocked in places and rough all the way which slowed us down even more. At Salford we realised just how late it had gotten and agreed it was better to part ways than face the inevitable “where are you?” phone calls from the bosses. I checked the mileage when I got home, almost 70 miles total for the day. The maps suggested it’d be a little over 50 miles… Ah well, at least we know why it took so long!